In a conventional pivoted tonearm, the arm is 'dragged' across the record's surface by the stylus following the record groove. A similar motion occurs in Clearaudio's tangential tonearms, but the arm moves tangentially, with the stylus propelling the tonearm along a linear bearing which comprises a carriage running on precision rollers along a meticulously polished glass rail. The cartridge therefore remains parrallel to the record groove, following the same path as the cutting head did when making the record, thus eliminating any lateral tracking error. And since the record groove, stylus, cantilever and tonearm are perfectly aligned, no side forces are generated and so anti-skating compensation is no longer required. 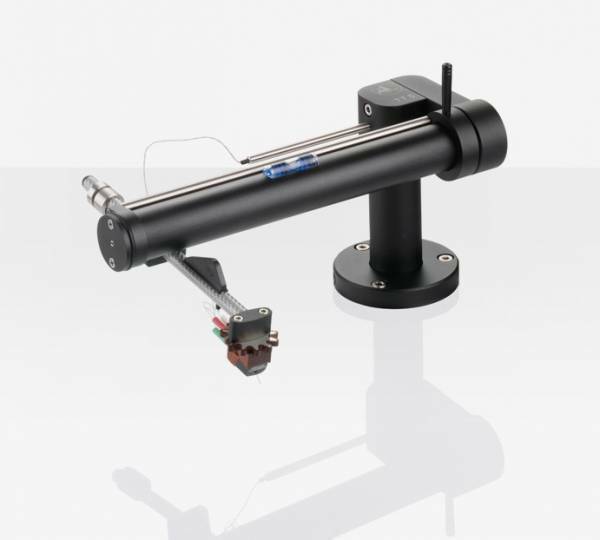 With the TT5, Clearaudio offers vinyl fans a more affordable entry point into tangential tonearm technology. The TT5's surprising and excellent value for money is down to eschewing one or two of the features of its 'big brothers', the TT2 and TT3. For example, the TT5 adopts a new, fully rigid design. However, for those who still want the convenience the bigger arms' ability to swing out of the way when loading records, Clearaudio have created the optional TT5 swing base which, as it's name suggests, allows the entire arm assembly to be swung out of the way when changing records. Review magazine "Audio" included the TT5 in its analogue highlights of 2015. We are confident that this will still be the case for many years to come. Related links to "Clearaudio TT5 Tonearm"
Customer evaluation for "Clearaudio TT5 Tonearm"